Good lord, nothing's getting built anymore. We'll take whatever renderings we can find - such as the above excellent piece of craftsmanship dubbed the "Stairway of Dreams." 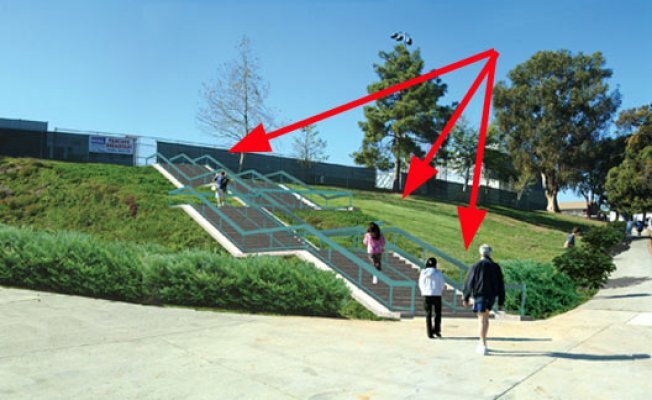 The Palisadian-Post reports that the concrete stairs, designed by architect Rick Poulos, will feature handsome aqua-turquoise blue railing and will climb a hillside, connecting a parking area and the Palisades Recreation Center Field of Dreams. The stairs will replace a dirt path. “It has been our dream to complete this project,” said Bob Benton, [Palisades Community Center Committee] vice chair and [Pacific Palisades Pony Baseball Association] commissioner. Many people use the trail to reach the fields, and several have fallen. The hillside is especially slippery after it rains, said PCCC chair Mike Skinner. The six-foot wide staircase was built thanks to $100k in donations. Construction is expected to begin within "the next few months."